• First of all make sure you have packed your emergency snow kit. This should include warm clothing, some food, water and a mobile phone plus car phone charger. • Allow yourself the extra time to drive more slowly and avoid overtaking. You don't need the extra stress of being late for and appointment. 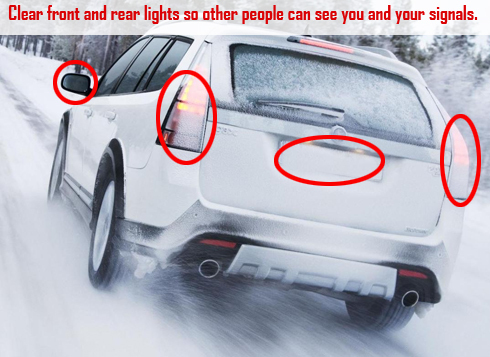 • Clear front and rear lights so other people can see you and your signals. • Slow down and don't drive too fast. No matter how good driver you think you are. • Use low beam lights. • Don't accelerate while turning. • Increase stopping distance, don't follow too closely and maintain a safe distance to 8-10 seconds rather than two seconds. • Apply brakes smoothly; it is better to approach a stop slowly by braking early rather than trying to stop suddenly. 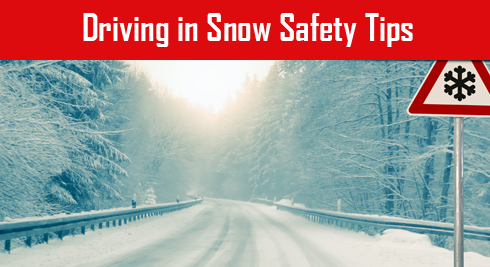 • If your vehicle begins to lose control on an icy road and you feel yourself start to skid or your tires start to slip, don't panic, take your foot off the accelerator, don't use your brakes and let the car slow on its own. A moving car has some traction, braking takes away the ability to control your vehicle. Turn the wheel in the opposite direction in which you are skidding. This may be counter-intuitive, it should prevent further erratic skidding and decrease your chances of getting into an accident. • Check your tire pressure. It's critical that your tires are equipped to handle adverse weather conditions, so check the pressure often. Deflated tires significantly decrease traction, increasing the likelihood of sliding on ice. For maximum safety, you may want to consider using snow tires. • Stay alert and focused, even when conditions appear to have improved. A split second can make all the difference in the world. • Your vehicle can do one of three things at any given time, and never more than one at a time in order to maintain control. You can accelerate, you can turn (steer), or you can brake. Not recommended in Snow Braking and accelerating at the same time just makes no sense, this will lead to skid. • More than 1.5 million annual car crashes associated with poor driving conditions caused by weather. These lousy driving conditions lead to an estimated 7,000 people being killed each year and 800,000 more injured. To avoid becoming another statistic, there are some common errors you should know so you can steer clear of them.